Appearance (0-20): Perhaps what’s most interesting about the Romeo is that they don’t follow the standard model for how they have been doing things. The majority of Romeo y Julieta cigars out there have similar banding, etc. 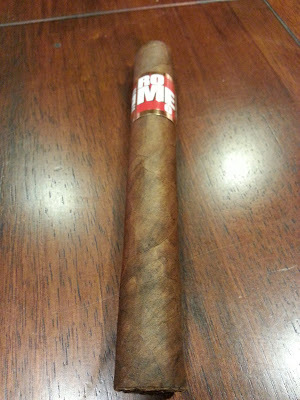 This one sports a bolder new design, proclaiming it the “RO-ME-O”. While it retained much of the coloring of a lot of the normal Romeo blends (red, white, gold) – it truly does differentiate itself. The wrapper is also extremely nice, using a dark Ecuadorian wrapper with very few flaws. I like what im seeing. Construction (0-20): I don’t think I have had any major concerns about the construction of a R&J offering in the past, and it doesn't seem to be one now either. It’s wrapped nice and tight and it seems the prelit draw is dead on. The exterior is slightly spongey but no issues there. 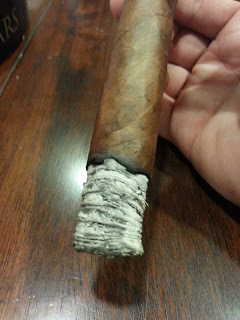 After lighting - the draw was burn, the burn was both cool and relatively straight, and the ash held on for more than 2 inches at a time. Zero pitting, canoeing, or issues that required a relight. Absolutely flawless. 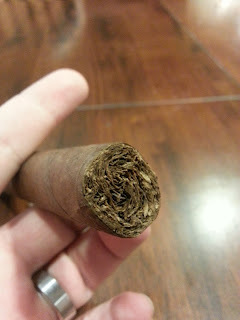 Strength (0-20): In comparison to most other R&J cigars, this is indeed more full bodied and is much higher in strength. Medium to full is the correct range for both, as it teeters between the two quite well, though I would place it closer to full. 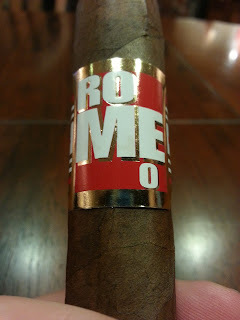 Flavor (0-20): The Romeo is rich and delicious from the first puff, dropping a combination of leather and peppery spice. A lot of more subtle flavors begin to creep in (earthiness and slight sweetness leading the pack), that eventually transform this into something more complex. There are also notes of a bitter dark chocolate that pop through. And those flavors then continue through the rest of the smoke. While it balances it well, I’d say the final third was a little underwhelming as the flavors remain stagnant. Value (0-20): While this wouldn't be a “go to” cigar for me, it’s absolutely worth its price. Overall (0-100): Let’s begin with speaking to the elephant in the room – Cigar Aficionado did indeed rate this as the #3 cigar of 2012. How? I have no clue. Then again looking at their listing, there’s a few I would have open debate about. However, I do think this would fall in the top 25 overall. It’s a bold new look for the R&J blend and a bold new taste too. Where milder tastes normally prevail, this is a full bodied stick with absolutely fantastic construction. Oddly enough the only real rub to it is that the complexity that is there in the beginning fades and it becomes somewhat boring in the home stretch. Still, it’s a damn good stick with flavors that will keep your interest (leather, pepper, chocolate, etc) even if it isn't melded perfectly. I give it the old thumbs up - this is worth trying, especially if you are someone who doesn't typically like their lines.